Coleoptera (beetles) is the order of insects that is characterized by having a biting mouth and two pairs of wings, the outer pair being hardened and meeting in a straight line down the back. Coleoptera is the largest order in the animal kingdom. There are about 400,000 described species worldwide, about 24,000 species in 131 families in North America north of Mexico. 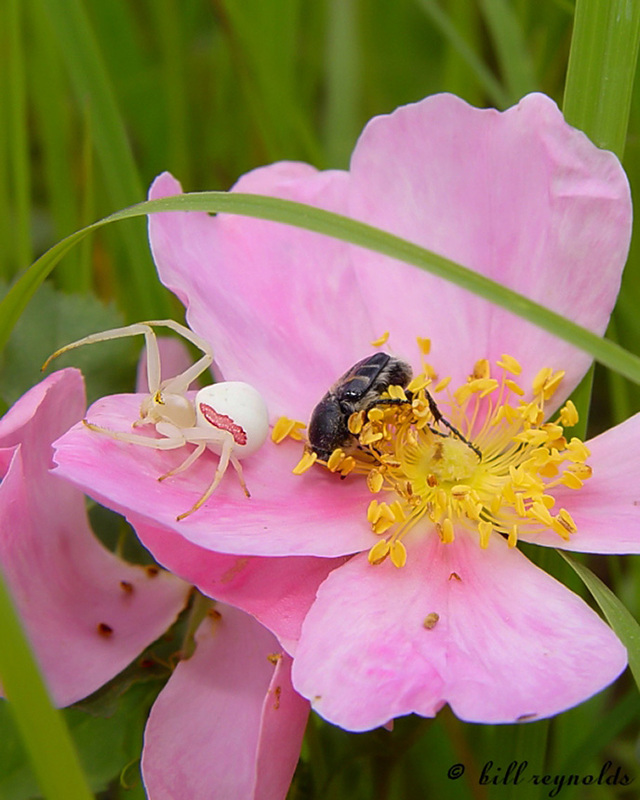 The total number of species, described and undescribed, is probably close to 1,000,000. It is likely that Coleoptera will be split into two or more orders in the future. Rhubarb curculio (Lixus concavus) is a large, easily identified, true weevil. It is common from New Hampshire, south to North Carolina, and west to Utah. It is uncommon in the upper Midwest, including Minnesota. At up to ⅝″ in length and 3 ⁄16″ in width, it is one of the largest snout beetles in the United States. Rhubarb curculio adults are active from mid-May to September. They are found on stalks and leaves of thistles, sunflowers, docks, and rhubarb. They are one of only two weevil species that attack rhubarb. They can be a pest to crops of these plants but they are easily controlled. Snout beetles are easily identified by their long, flattened or cylindrical snout that is at least as long as the pronotum. Rhubarb curculio is easily identified by the bright yellowish bloom on the head, pronotum, and wing covers. Six-spotted tiger beetle (Cicindela sexguttata) is a small predaceous, tiger beetle. 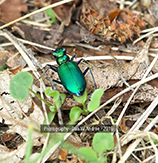 It is probably the most common species of tiger beetle in eastern North America, possibly the most common on the continent. It is found in the southern two-thirds of Minnesota. Adults and larval burrows are very often seen on paths in the woods. Six-spotted tiger beetle can be thought of as a woodland path species. The head and body are shiny, iridescent, and usually metallic green, occasionally blue. Flashy tiger beetles (subtribe Cicindelini) are usually identified by the color and pattern of marks on their wing coverings. The common name of this species comes from white spots on the wing covers. There are usually six small spots, often eight, rarely ten, and occasionally none. At 1¾″ long this may be the largest click beetle in our area. With its boldly-outlined eye spots it is certainly the most distinctive. The body is long, thin, and black, with mottled patterns of minute, whitish scales. The thorax has a pair of large black spots boldly outlined with white. The spots look like eyes and give this beetle its common name.